While there are a host of tablet accessories on the market that are designed for comfort and aesthetics, not many are geared to absorb excessive heat. For men, it has been medically proven by the State University of New York at Stony Brook that extreme heat from devices held in a man's lap lowers sperm count and increases in-fertility risks. 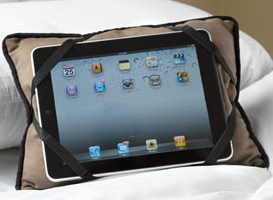 The iBuddy offers the ultimate in comfort and protection, not only creating a nearly weightless experience with their internal weight-shifting material but also absorbing and redirecting the heat emitted from the iPad 3 and other tablets. -- Roy Sokol offers men a chance to be heard and women a rare opportunity to view the struggle with in-fertility from a male perspective. In-fertility and Adoption: A Husband and Father's Perspective brings to life the frustration, anger, humor, heartbreak, and sense of helplessness and a mental philosophy learned in Marine Corps training that helps in overcoming the psychological barriers. While miracles in technology have brought joy to new families, those very advances have placed many couples into a spiraling cycle of hope and heartbreak. One failed attempt may lead to another, but how do you give up when there is always another doctor, another procedure holding the possibility of your dream for a family?